The era of the greatest playsets explodes as competition grows fierce to take over Louis Marx’ position as “World’s Largest Toy Company.” Told from the inside out - go back inside the offices as crucial decisions are made, during the advent of television, the growth of toy giants and be at the Glen Dale factory during its peak years outputting playsets. Full of new information (like, who “really made those substitutions in playsets and why” -- travel with Louis to exotic places as he builds an empire and battles competitors. The story that puts you there has never been told until now in 200 full color, action and information packed pages! Foreword by Charles Marx. Many new 2 - page spreads of playsets. - 25% more pages than Vol. 1 - full color glossy pages - Lavishly illustrated - presented as a lifetime collectible. 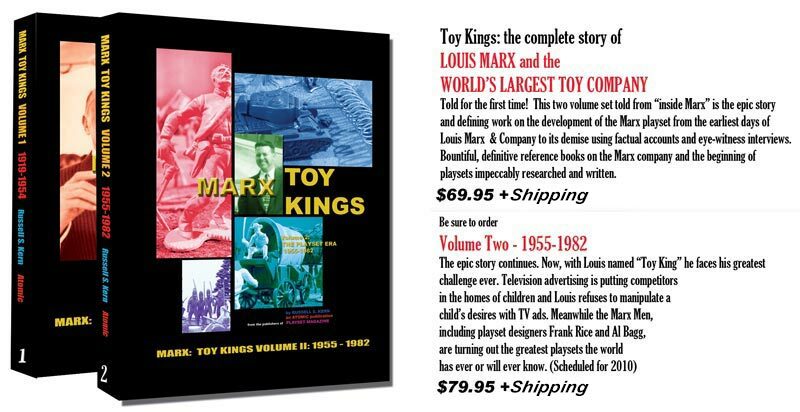 Marx Toy Kings Volumes One and Two Available Now!